This is a very funny cat photo! 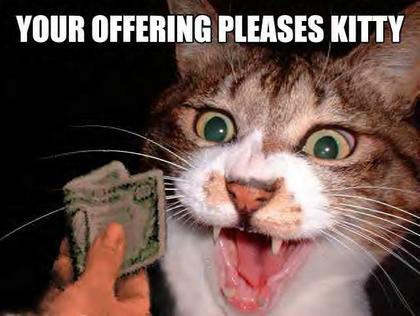 Ur offering pleases kitty! Cat with money lol cat photos. Please give voting and comment down below in the comment box! Funny or not? Go on, tell everyone! PS: Hey, do you like this? Why not bookmark it or digg it? Or better even, sign up to our rss (the orange thing on the top) button and you will be notified every time I post funny cat photos, useful cat articles and more! Isn’t that great? This entry was posted in CatsHome and tagged funny cat, funny cat and kitten photos, funny cat photos, funny cat pictures, Funny Cats, funny kittens, kitty cat, lol cats, lol cats and kittens, lol kittens, very funny cats on September 29, 2009 by CatCamille.